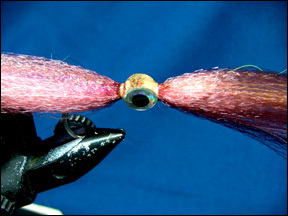 I developed this fly to imitate the action of your typical “parachute” jig – one of the most relied upon jigs in a striper fisherman’s collection. The fly is quite bulky so not an easy one to throw. I set it out and strip it in a current behind the Stray Cat as we stem a moving tide on the many shoals surrounding Cape Cod and the Islands. It has become my No. 1 lure as it has allowed my customers to consistently catch big fish on the lightest tackle possible. I believe the action created by its design and colors which imitate an excited squid make it so successful. I have caught bass, blues, bonito, tuna, fluke and even barracuda on it and there are now a number of top skippers using it. Danville 210 denier, flat waxed nylon thread, fluorescent pink. 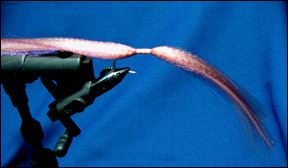 Wrap hook shank with thread from 1/8” behind eye to 1/4 inch before hook shank and secure with Zap-a-gap. 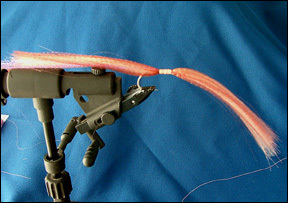 Secure a sparse amount of Polar White at the hair’s midpoint and spread evenly around the hook shank. Follow this with an equal amount of the Flo. 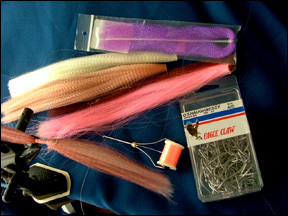 Pink again equally surrounding the hook shank. 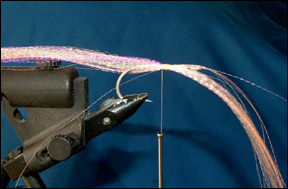 Tie in the Purple Flash extending only towards the rear – this creates fewer tangles when fishing the fly. Tie in a larger amount of Tan hair, spread evenly again around hook shank. Follow this with the Brown hair. Bring the thread forward till the hair splays out some. Mix up the epoxy and coat the threads, then rotate fly so the epoxy lies out evenly. While the epoxy is still tacky, stick on the two eyes in center of thread area and allow the epoxy to harden. Now build up the area between, in front of and behind the eyes with more epoxy and again rotate the fly till the epoxy hardens. Finally, I like to cut the hair back a few inches in front to help the forward facing hairs bend back in the current.